My latest cartoon QSL commission was a lot of fun. Margie, KK4AGN, and her husband Gerhard, KF4GGK, travel the country and the hamfest circuit in a Winnebago — that is, when Margie’s not editing the club newsletter for the Anderson (S.C.) Radio Club. That’s why she wanted the Winnebago on her QSL — along with her dog Skipper. (We’re going to assume Gerhard is in the back, operating mobile.) 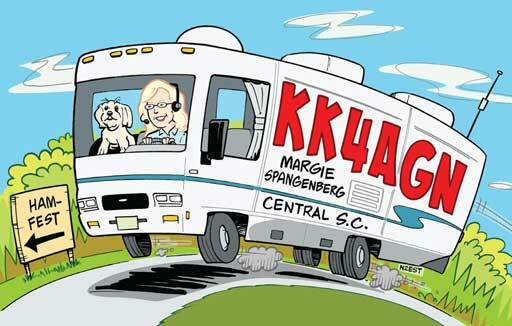 This commission required drawing a specific vehicle in cartoon form, along with likenesses of both Margie and Skipper. I think Margie liked her caricature. If Skipper doesn’t like his caricature, he’s not saying. This entry was posted in cartoon QSLs and tagged amateur radio, Anderson Radio Club, cartoon QSL, dogs, ham radio, ham radio cartoon, ham radio humor, Hamtoons, KK4AGN, mobile operation, N2EST, QSL, RV, Winnebago. Bookmark the permalink.